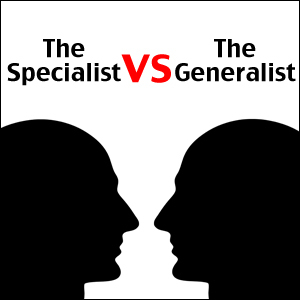 The other day, a client of mine brought up this topic concerning the value of a specialist compared to that of a generalist. As a business lawyer, he challenged the notion that in our society, specialists are much more appreciated – and paid! – than generalists. My client reasoned that if a GP misdiagnoses you and sends you to the wrong specialist, or to none at all when he or she should’ve, the results can be catastrophic. He gave another example closer to home for him; business law. As a “first response” business lawyer, he gets all the questions and cases thrown at him. He is a generalist who knows a little about a lot. He enjoys communicating and collaborating with lots of different parties and functioning as a “bridge” between all of them. I firmly believe we’ll be seeing more and more organizations that do value the “jack-of-all-trades” aka generalist aka cross-disciplinary and cross-cultural employee that brings an understanding to the table of more than the little square in front of him. This trend has already started with globalization and technology. What do you think? Are you a generalist yourself? If so; do you feel you get the credit for your role that you deserve? I’ve always enjoyed this quote by Robert Heinlein (1907-1908) Novelist, short story author, essayist, screenwriter. I am indeed a generalist and while I used to feel this was a disadvantage (didn’t know much about anything…), recently I started to use this to my advantage for indeed the reasons mentioned above: I realized I always look at the big picture and am able to communicate well with the various parties involved – bridging that gap, connecting, able to help others make that shift.